Huli Ka Balbon! Nag Angas na Driver Hit and Run, Di Nya Alam GM ng MMDA Kausap nya! Home / News / Huli Ka Balbon! Nag Angas na Driver Hit and Run, Di Nya Alam GM ng MMDA Kausap nya! 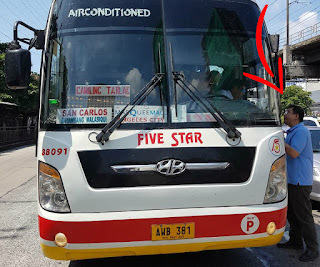 Jundy Javier, driver of a Five Star bus bound for Camiling, Tarlac couldn't have picked a worse victim for his reckless road behavior. Driving on EDSA Sunday morning, he sideswiped no less than the vehicle of Transportation undersecretary for road transport and Metropolitan Manila Development Authority (MMDA) general manager Thomas Orbos. Compounding his offense, Javier drove off. 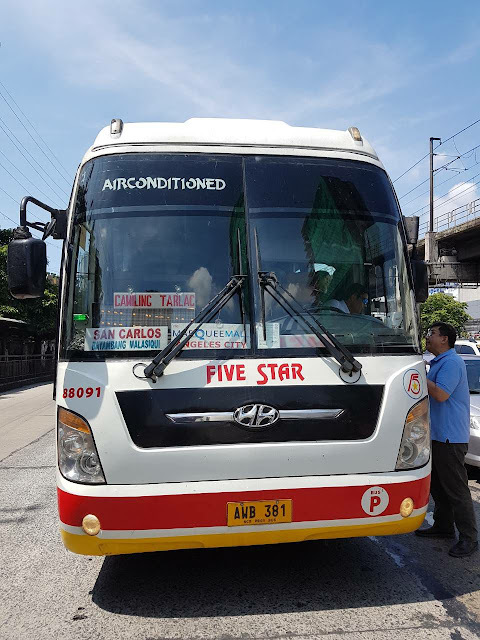 Orbos, who was driving near the EDSA flyover in Ortigas with his wife as passenger, caught up with the bus and blocked Javier, who, however, allegedly then accused Orbos of having been the one who sideswiped his bus. 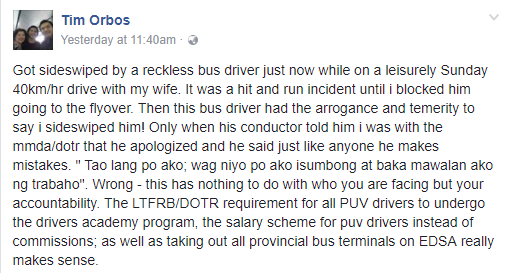 On his Facebook account Orbos posted: "Got sideswiped by a reckless bus driver just now while on a leisurely Sunday 40km/hr drive with my wife." Orbos claimed that it was a "hit and run" incident. He said the bus hit the side mirror of his Toyota RAV-4 vehicle but the driver did not stop. He then decided to block the path of the bus as it approached the flyover. “Then this bus driver had the arrogance and temerity to say I sideswiped him! Only when his conductor told him I was with the MMDA/DOTr that he apologized,” Orbos said. Javier, according to Orbos, had pointed out that the damage he caused was not that big since he only hit the side mirror. “…And he said, just like anyone he makes mistakes: Tao lang po ako; ‘wag niyo po ako isumbong at baka mawalan ako ng trabaho”, Orbos quoted the driver as saying. This got him irked. “Wrong. This has nothing to do with who you are facing but your accountability. The LTFRB/DOTr requirement for all PUV drivers to undergo the drivers academy program, the salary scheme for PUV drivers instead of commissions; as well as taking out all provincial bus terminals on EDSA really makes sense,” he pointed out. Right after the incident, Orbos ordered that Javier be sent to the driving academy of the Land Transportation Franchising and Regulatory Board, and to undergo an assessment and pass an examination to determine if he can be able to drive again. Before falling victim to road recklessness, Orbos had stressed the need for all public utility vehicle drivers to undergo the mandatory driver’s training, given overwhelming data that much of the rising incidence of road crashes is marked by human error. Orbos said that the training should be through the LTFRB. It started last August 17.